I would think if you make it bigger why not use the whole horizontal space. then you know left of the screen is under and right of the screen is over, as long as we are in the middle we are good. 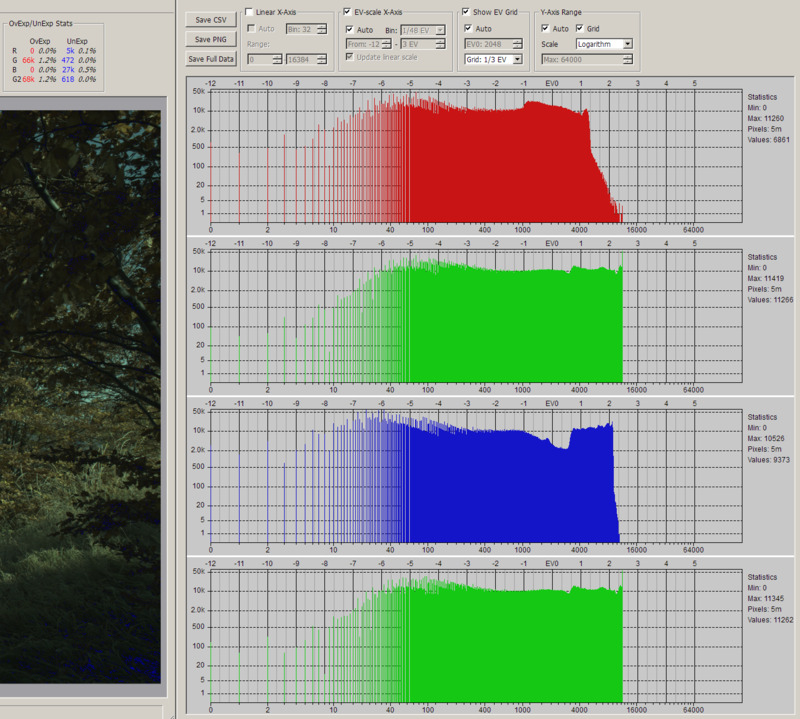 What I mean by this is why the histogram is aligned on the right side if the screen instead of centred. Also the underexposed grey fill looks less distracting of its on the left side of the screen instead of in the middle right? A bit cluttered for my taste after enabling the zebras, but I'm not sure what to change. The exposure indication is harder to find (low contrast); it's obvious in the small version (being white on black also helps). Maybe it should be moved at the bottom and displayed with black background in the large version as well. edit: updated second screenshot to show both versions. edit: the top bar somehow vanished, but to me it looks cleaner without it; what about making the EV grid lines smaller as well? That last example looks schmick. Let's restore ML help together! / Help ML / Forum dropbox direct links here. Looking forward to this feature being in the experimental builds, ie to try out. 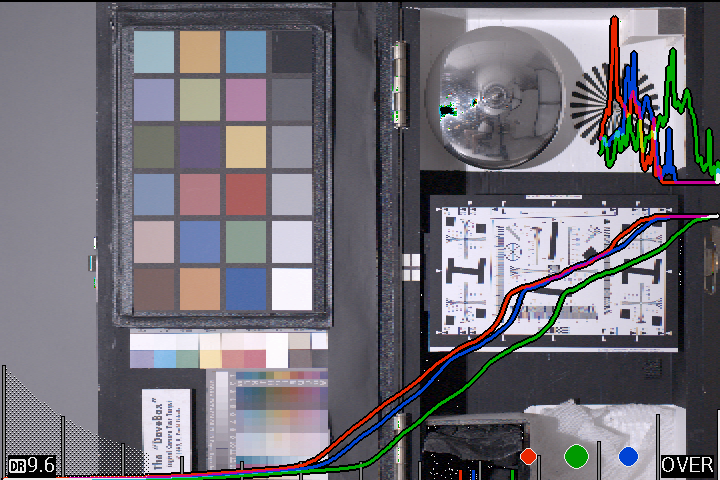 A thought I had, as a stills photographer, is: Once composition is fixed, then looking at the scene becomes secondary, hence can we make use of toggling through INFO to provide a view of the large histogram on a white background? 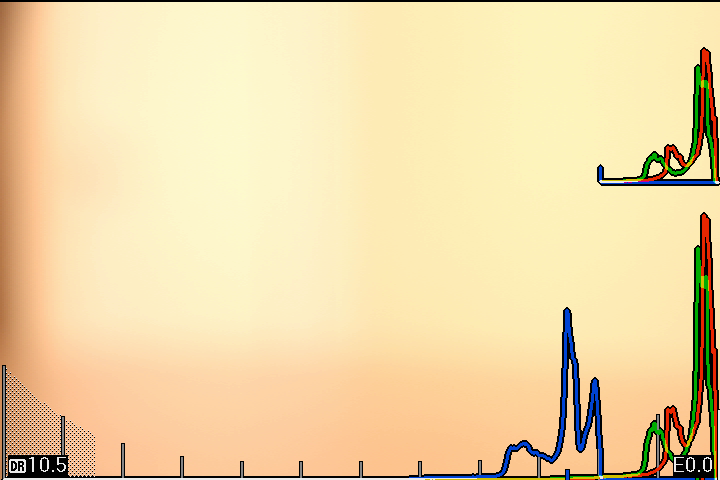 Trying to read the histogram over a scene is not ideal. In my focus bar script I try and do this, but I'm afraid, using 'just' Lua, I do get conflicts in writing to the screen. I've tried tracking GUI states, with camera.state, but not very well. I am really happy to see how things are improving. Great work. I also like the DR indication. A bit cluttered for my taste after enabling the zebras, but I'm not sure what to change. Perhaps add options in menu, so the user can choose what elements to have displayed to their own taste. FWIW colored zebras don't work really well while shooting. 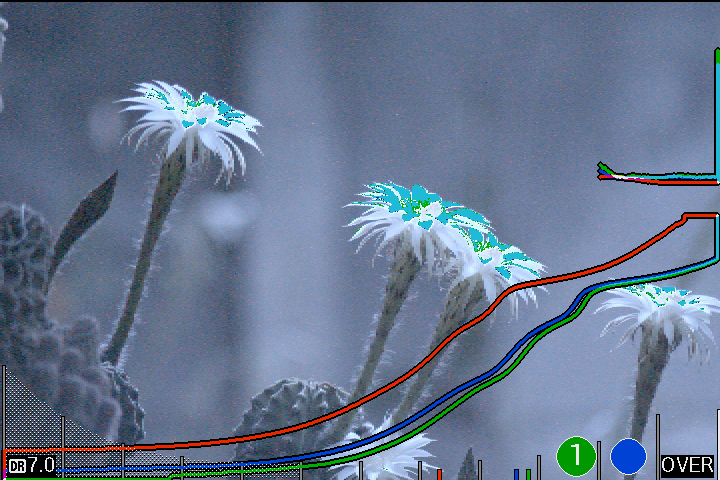 Example: shoot something green (leaves) and see green zebra on top of it is very difficult to see. Pretty much the same happens with other channels, so maybe another form of zebra display could be good to, e.g. inverted colors: magenta for G, green for R, yellow for B. Or maybe blinking. 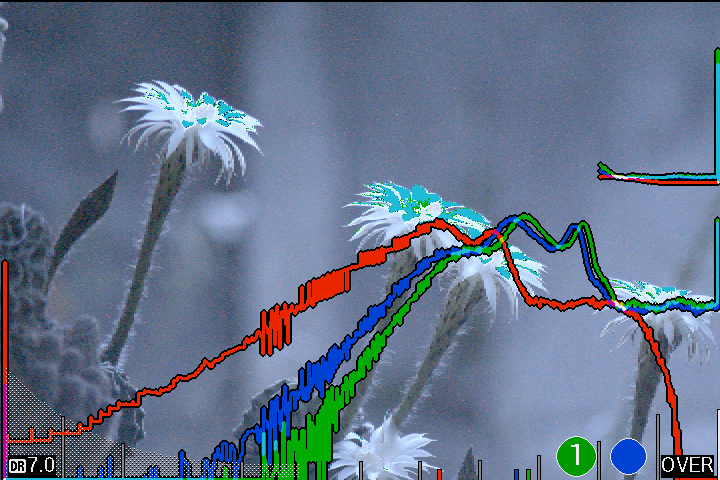 Can you also make an option to display only the top and/or bottom 1EV of the histogram but zoomed at full screen? 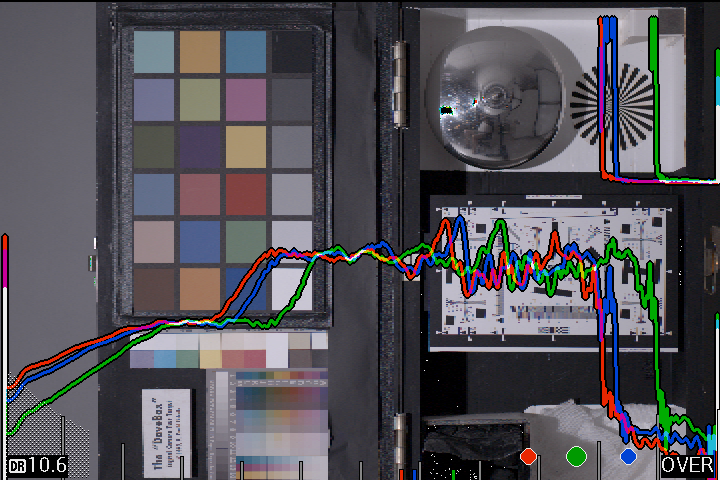 While shooting we don't actually need full statistical analysis of the image (full histogram). What we need is to check exposure at the extreme highlights and shadows. Do you think it would be possible (worth it) to have (an option) for separate display of the two G channels as histograms? 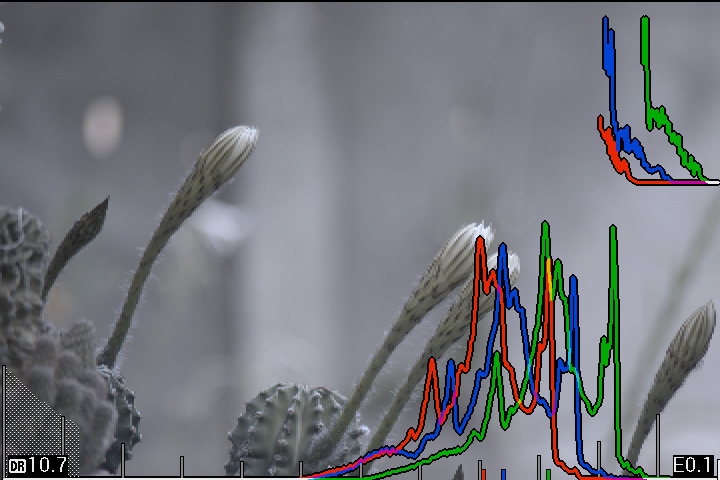 Sometimes they are not the same and clip differently so I've been asking myself what the current G channel histogram actually displays. Perhaps the shadows can be smaller, so that there is more room for highlights histogram, for example 25% width for shadows 75% for highlights or something like that. May I have the second image for tests? +1 and very well said! That's not exactly an accurate example as the display shows 17 stops. The point still stands regarding the advantage of increased resolution in the highlights. What is the usefulness of the shadow area being presented in the manner that rawdigger does? Personally I prefer the grey marking that ML currently displays. I don't need to see the lack of bits being represented the way that rawdigger shows, only that there is simply not enough bits there, and that there is data being contained within. 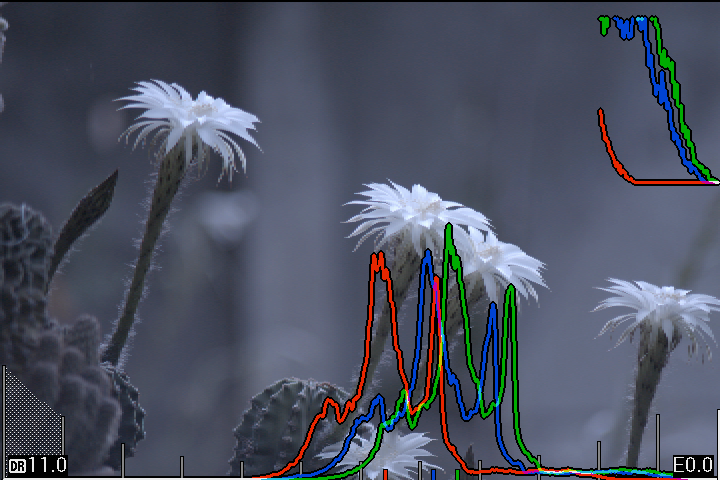 I would like to see the current histogram shadow area being user adjustable along the lines of the zebra underexposure option. 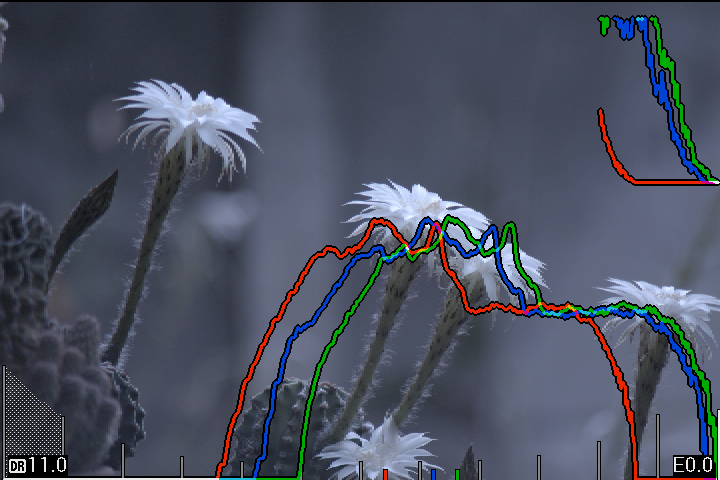 So as a user I can decide, I don't want any data contained within the bottom three stops, and the grey overlay on the histogram will represent these bottom three stops, and I can then move the data in the histogram as needed with exposure. 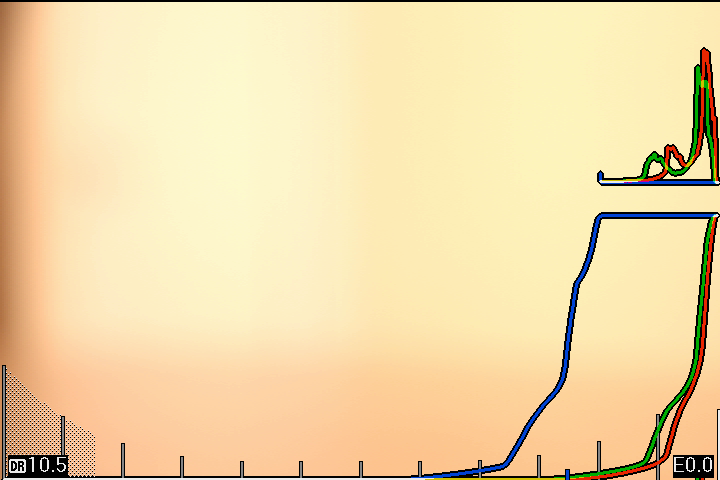 The linear zoom on the Y axis in the last stop makes sense - it's easier to judge the clipping status in tricky cases. 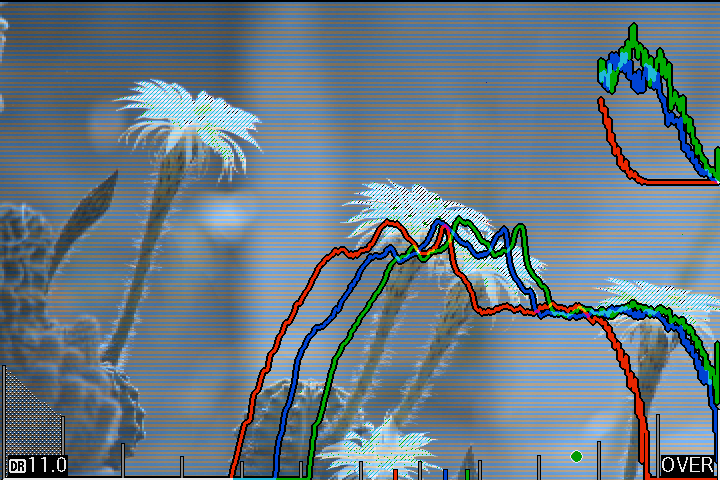 - when exposure changes, the entire histogram translates horizontally. 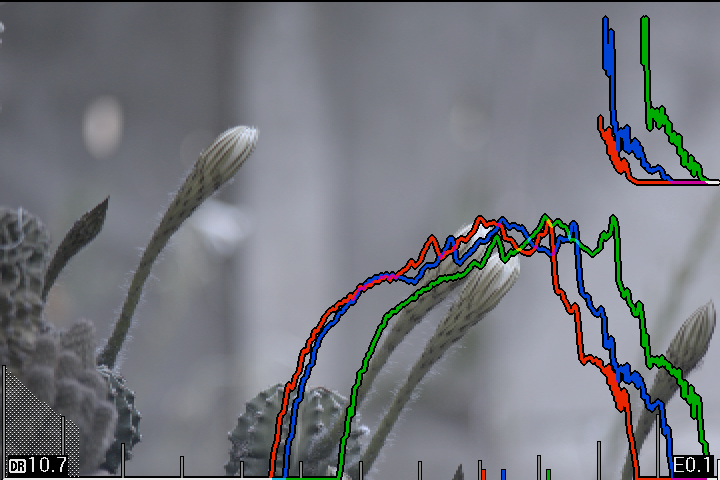 BTW, there is already a linear Y scaling option in ML histogram menu. It's off by default because whenever there's a large peak (strong highlight, large flat area, whatever), it will make all the other things look tiny. Try evaluating the exposure from it on the examples below. 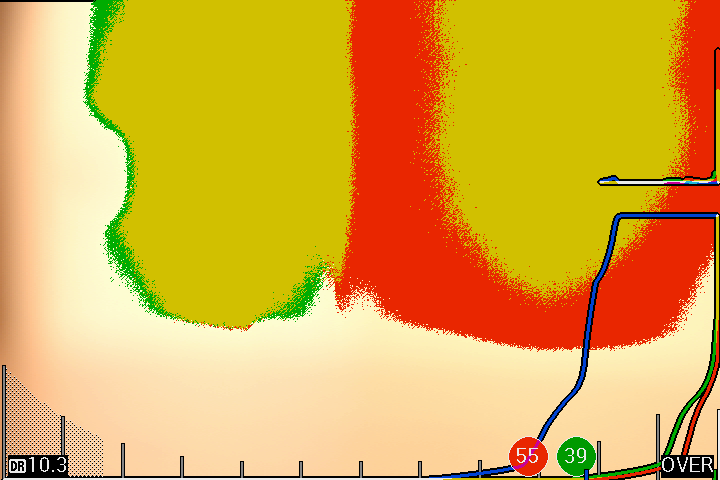 The above points are exactly where AutoETTR evaluates the exposure (median, shadow percentiles). The CDF doesn't do a very good job showing the overexposure (it's not obvious if only a small percentage is clipped), but a zoomed view on e.g. the last two stops (EV on X, linear on Y) shows exactly that. 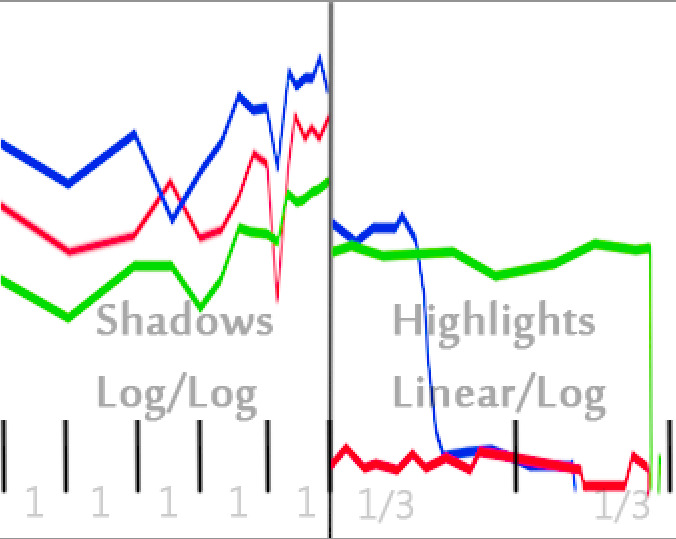 Examples (left: log-Y histogram, middle: linear-Y histogram, right: linear-Y CDF). 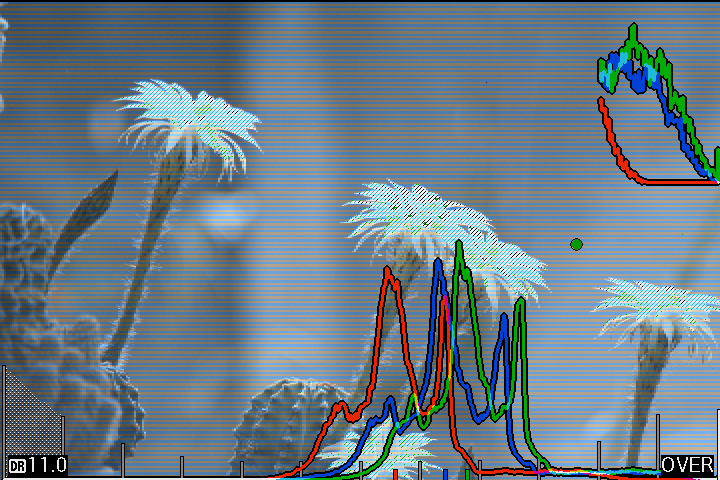 Note: in all the above examples, the histogram was heavily smoothed, while the CDF is totally raw. RawDigger displays thin bars. 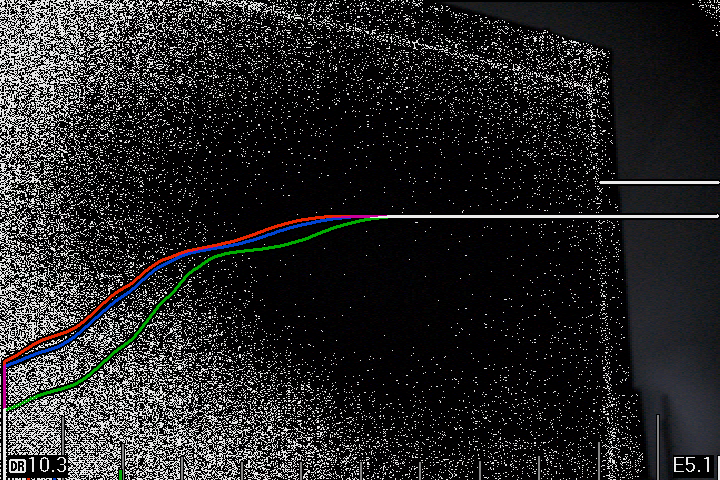 ML spreads them to nearby bins, to get a continuous graph (though it's still jagged). To draw the lines nicely, I've applied some additional smoothing in shadows, and also wherever the number of data points was very small. You may want to know how much I'm smoothing, so here are some examples. 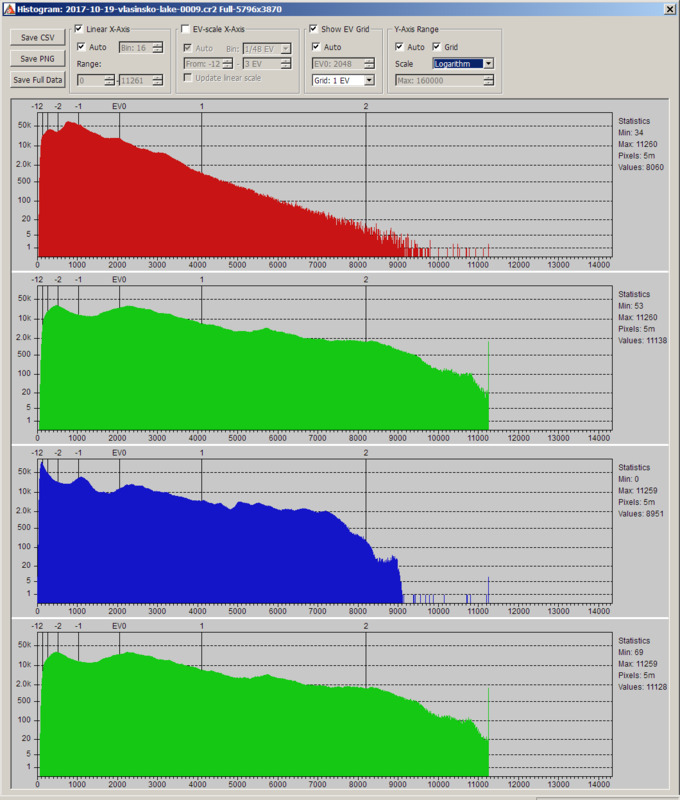 Top: log histogram. Bottom: CDF. Left: raw (no smoothing, no spreading). Middle: shadow spreading only. Right: spreading + smoothing. Test image: ISO 3200, 2-minute exposure (AutoETTR was a bit overzealous when picking this ISO). In the CDF images, there's barely any difference! They are already smooth out of the box! 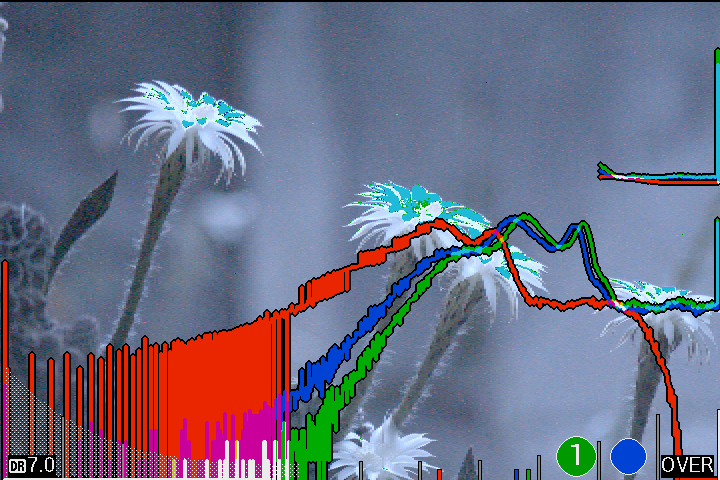 On the other hand, the histogram requires aggressive smoothing to look acceptable. CDF already looks very good after spreading - there's no need for additional trickery. Unfortunately I can't send the raw file for which this histogram is shown but I can try to shoot another one with slight clipping of highlights and shadows if that is what you need for testing. Please let me know. Or it may be faster to use one of the studio samples from dpreview or imaging-resource.com. This one seems to have slight clipping of shadows and highlights. That's not exactly an accurate example as the display shows 17 stops. 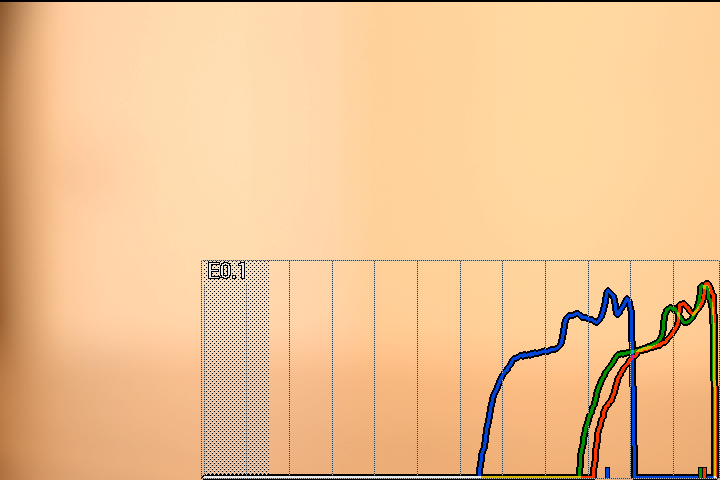 Yes, because as the screenshot shows it is using Auto setting for EV scale on X-axis. 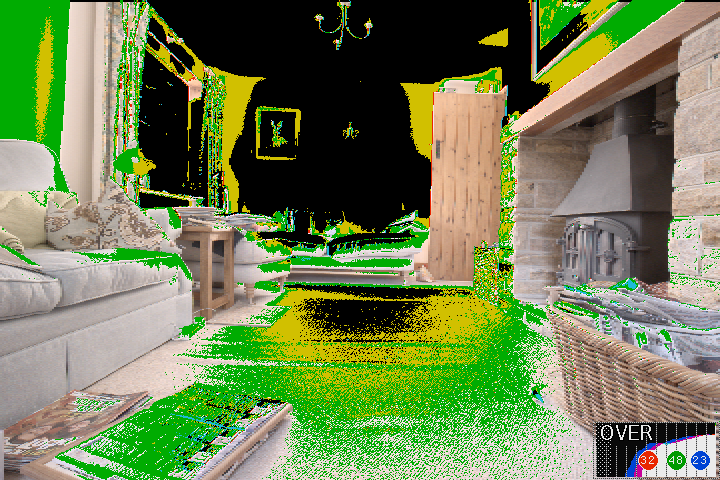 With 14bit raw files we obviously can't have values above 2^14. 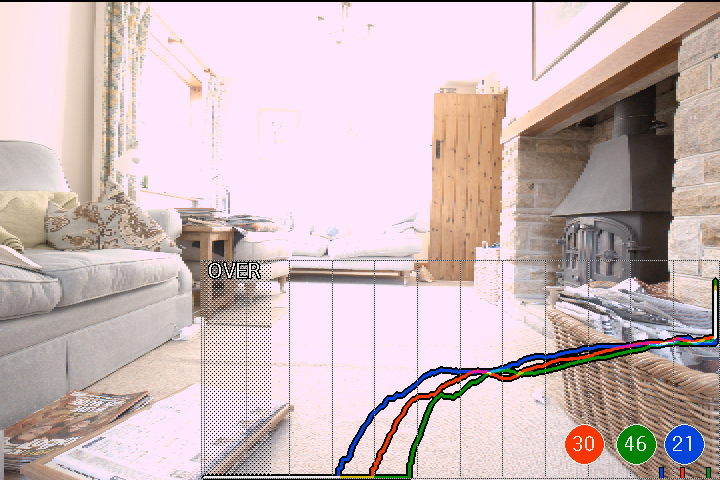 Evaluation of shadow clipping based on the actual raw data. It is not necessary to have it identical (jagged). I just mean to have a "zoom" of the shadows too. Of course we don't want data in the lowest bits but sometimes it is not possible to avoid it. Example: in an outdoors shoot we can't control the fill light in the shadows of the far away trees like we can in a studio. So being able to evaluate that visually is a plus. Don't you think? However, linear scaling on the X axis does not - at least to me. Why? Just look at the examples. 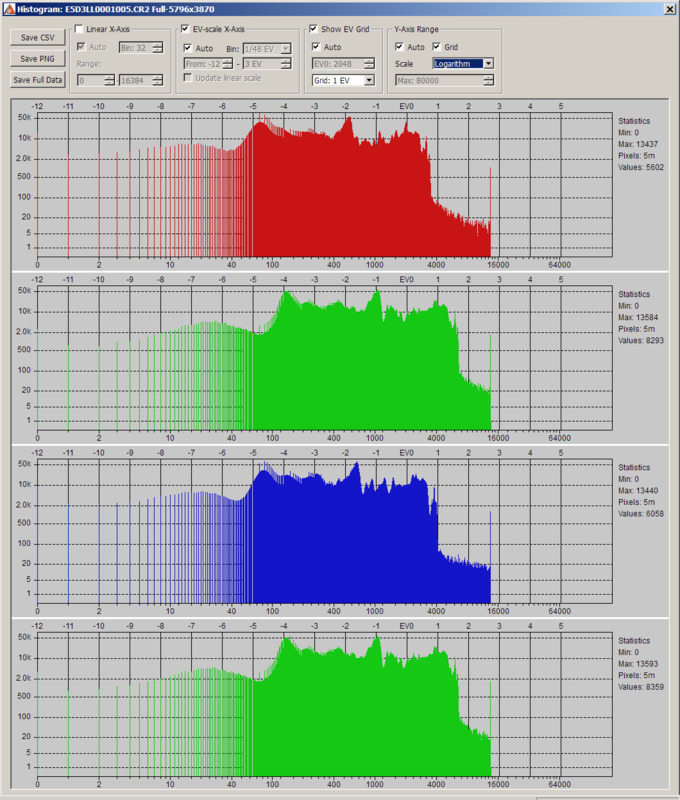 It shows much better the peaks in clipping. Log X smooths it because logarithm naturally compresses the levels horizontally. But the whole idea of having bigger histogram of highlights is the visual (human intelligence) evaluation of the shape of the highlights. 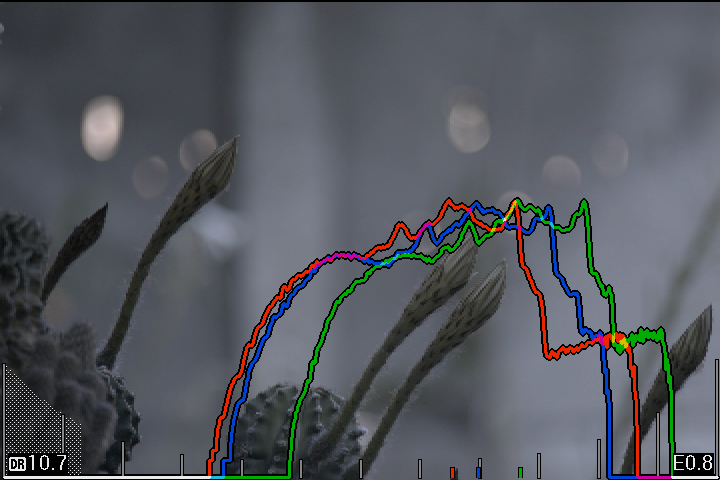 While shooting we are not really interested in what is in the middle of the histogram and how it translates left or right. 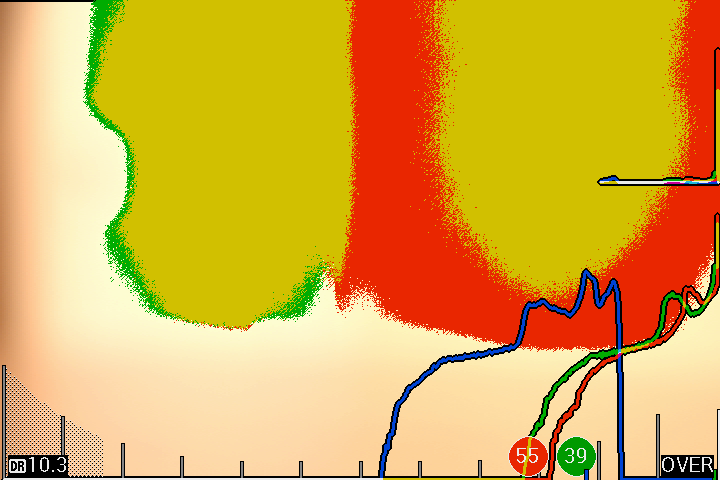 We want to maximize the use of the sensor where we have most levels (ETTR), right? I agree that the raw without smoothing creates cluttering, so it looks better with spreading + smoothing (as long as that doesn't affect accuracy). CDF... I don't know. Personally I am not used to it (perhaps most people too). It looks like a lot of wasted space is wasted just to display a smooth S-like line which doesn't really say what adjustment of exposure might be needed for ETTR. Perhaps it may be useful for shadows only. I am really curious if this will work. Yes, but there are scenes where you have to sacrifice some highlights (think something with strong lights, or any scene where you may want to use Dual ISO). In this case, guess where you have to look - at shadows and midtones! Look up previous discussions on Auto ETTR, SNR limits and related stuff. 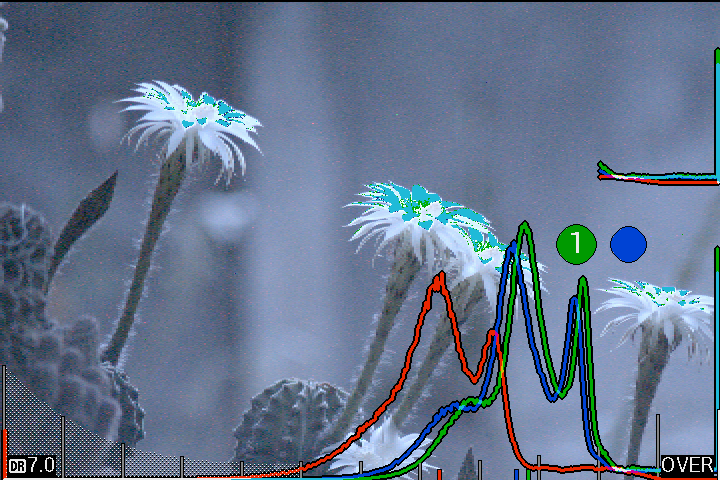 Left and right translation is essential - you'll know how the histogram will look like after adjusting the exposure. At a glance. It does! Have you read this? Thumbs up here for CDF. Would be handy to have markers. Perhaps on the right hand side. Median and 5th percentile? If you can draw a line from those markers to their position on the graph that would help to have an accurate determination. Perhaps even allow user adjustment (think SNR limits in ETTR). It would probably be useful to have a fixed x axis also, to ensure the 'useful' data is displayed with the highest resolution, and we don't just end up with a graph that uses all of the available resolution to display an outlier. By useful I mean the tail, and being able to see any valley's between clusters*. Markers on the graph for infinity values would help to make it obvious that infinity has occurred. 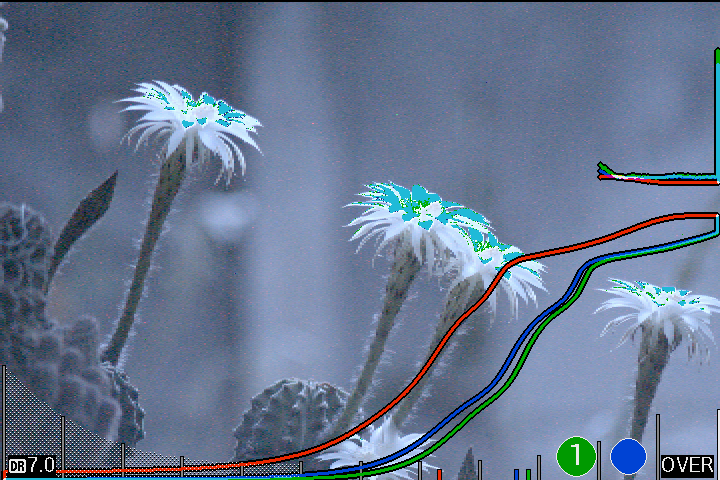 You would need to rework the markers on the bottom of the display for CFD mode also, correct? Thanks for the display top right a1ex (what the initial bugging you was all about). It is nice to be able to see these things with eyes. P.S. 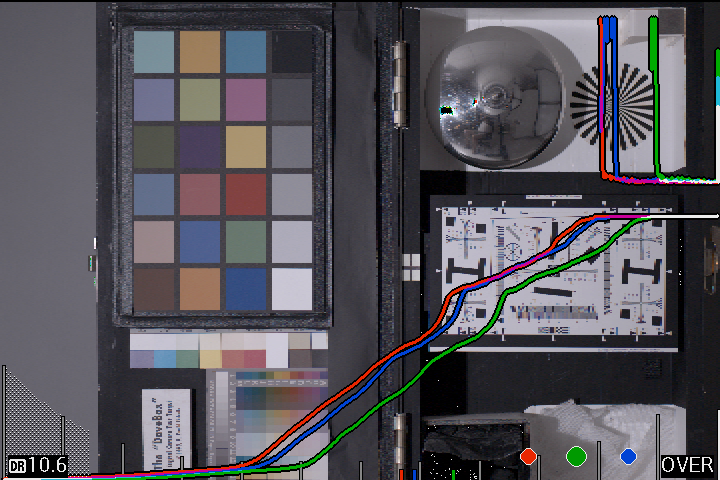 If you send through some images when the code is commited, I'll be sure to update the raw based exposure guide asap. *edit: hmmm, I'm not sure now. Being able to visually see that an outlier is present has it's uses also. Perhaps that outlier is a specular highlight, so then we could adjust exposure as necessary. And removing the outlier also means that without careful consideration, one may mistake the visual representation of the data, and assume that useful data has not been quashed by specular highlight. Markers on the bottom? 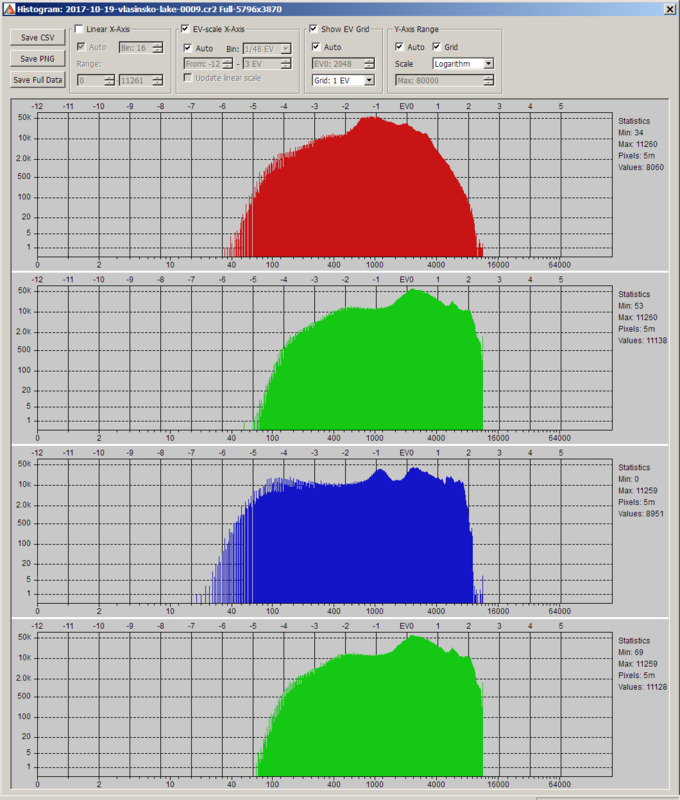 Both CDF and histogram have the same X axis (you can superimpose them if you like). In all the above examples, I'm showing 12 stops below white level. 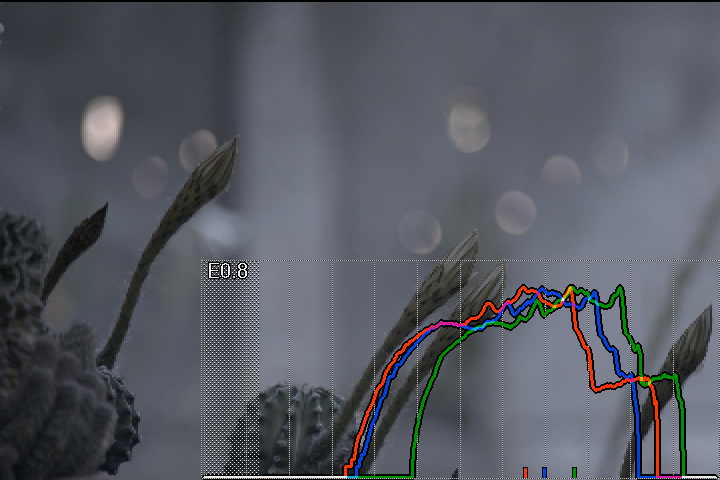 The zoomed view also shares its X axis with the rest of the graph (that's why it's placed above). Another argument for log X: you can see the specular highlight clipping (in this case you have to clip it, otherwise you'll end up with a really dark image), and you can also evaluate how many stops there are until the non-specular highlights (that you probably don't want to clip). In this particular image, you can probably push the exposure to the right by one extra stop, without much loss in that specular highlight. I've read the amount from the zoomed view - I couldn't have done that with a linear X. 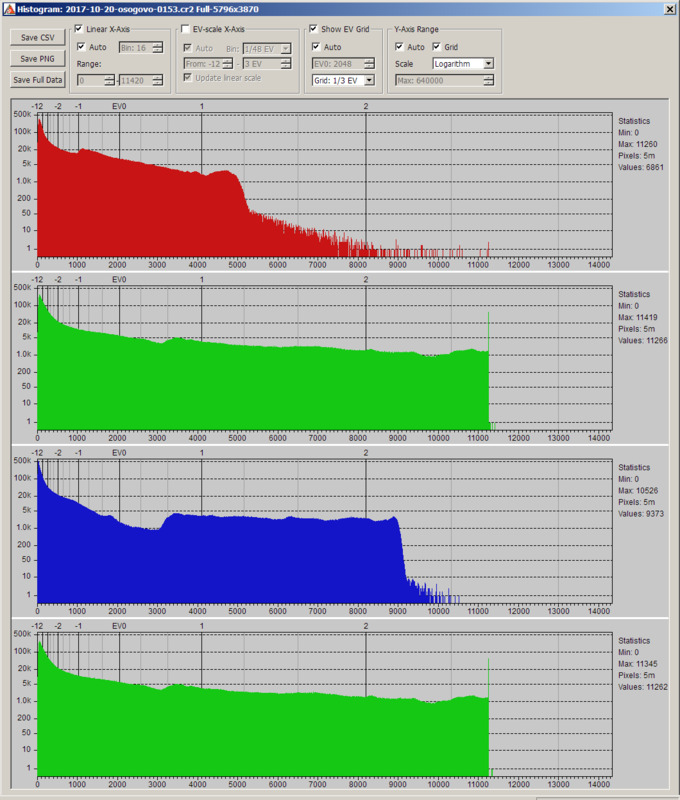 The histogram on the left appears to have data extend to 7.5EV below saturation, the histogram on the right appears to have data that extends to 6.5EV below saturation. These next two highlight the difference better. When I look at all of the comparison images you linked, you can clearly see how the data matches between the different histograms. Yeah, that's the difference between log and linear histograms. CDF is linear - maybe it's worth "compressing" it somehow? That would be a nonlinear scale on Y that reveals the small "details" in a way similar to log. I'm not sure how to come up with a well-defined mapping based on pure log (or whether that even makes sense). Hmm, so how does this fit in? I'm thinking to use markers like in the above image, with the median and minimum representing something similar to ETTR SNR. 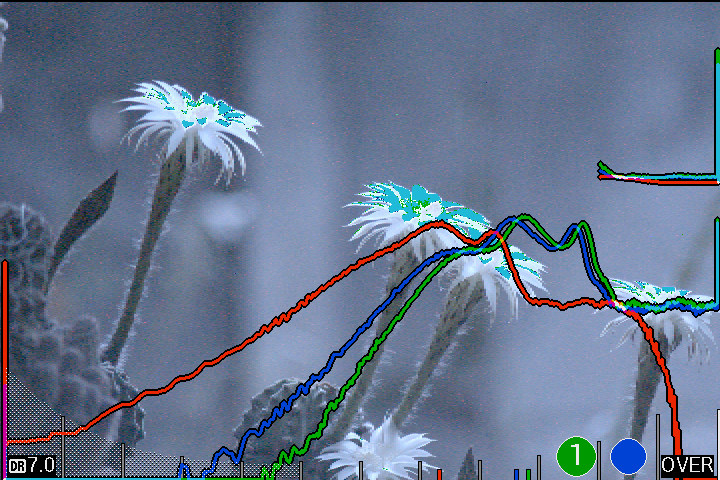 This way we could see what data falls below, or lies above the ranges. But I didn't realise CDF was linear, and it would be nice (I guess) to see how the data falls regarding EV scale, like all of the other ML exposure feedback tools. Transforming linear to log is significantly above my pay grade. I can google search. But still no idea if it helps the current situation. X scaling stays the same (EV), Y gets compressed to reveal the smaller percentiles. Thanks a1ex, now it makes sense. 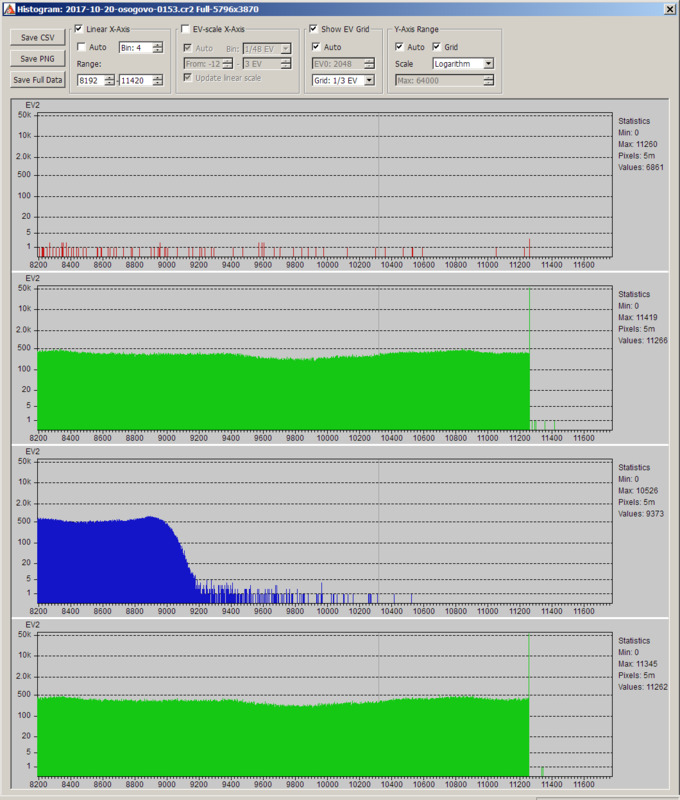 The spike at the right hand side of the clipped compressed CDF graph was throwing me off. And for some reason I was expecting the shadow area to look different also. 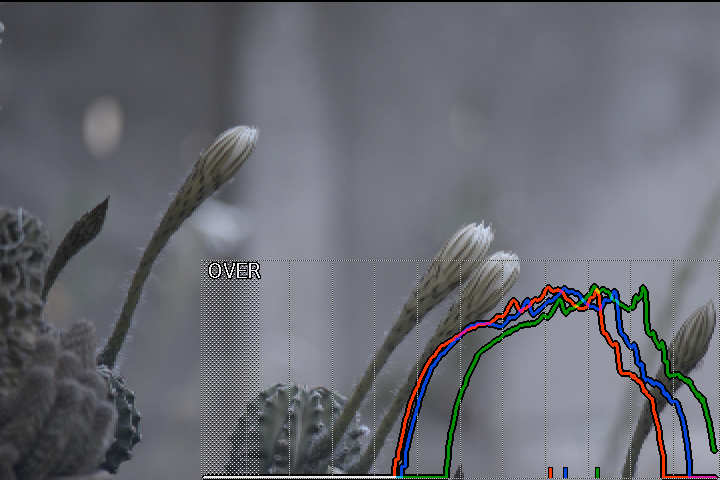 But if you have to overexpose highlights, then midtones become highlights, so you still evaluate highlights and control how much you overexpose. It is still highlights control, is it not? That's true. The problem is that we don't have a 30" LCD on the camera to see everything So I am just thinking about using the available space for the most critical things. BTW if CDF is used - the exposure movement becomes more complex, not just left/right. 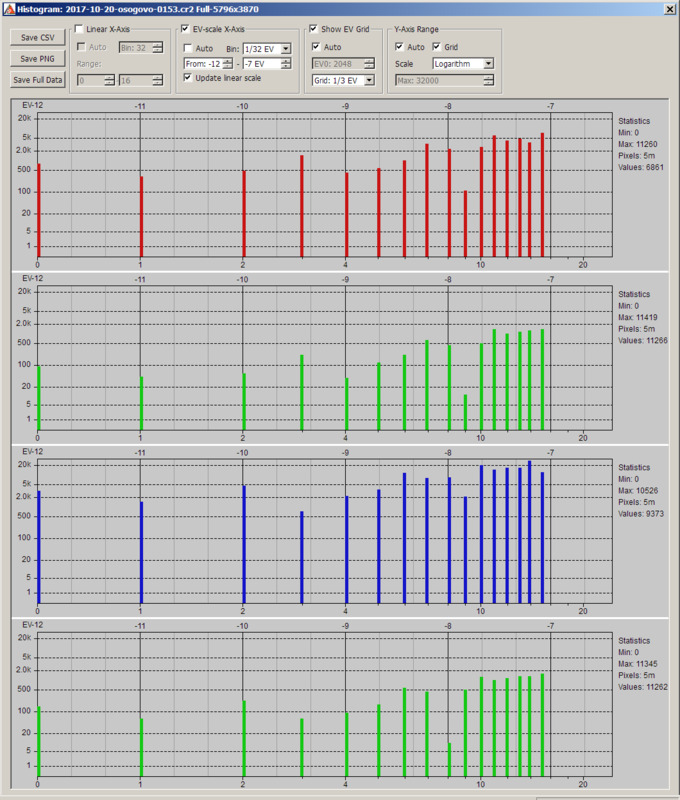 Yes, the CDF shows a flat area at the end and for non-clipped ETTR one should aim for not having any flat area on the right but I suppose it needs testing in real conditions. So maybe the best thing to do is to have an option in the menu what to display: histogram or CDF. 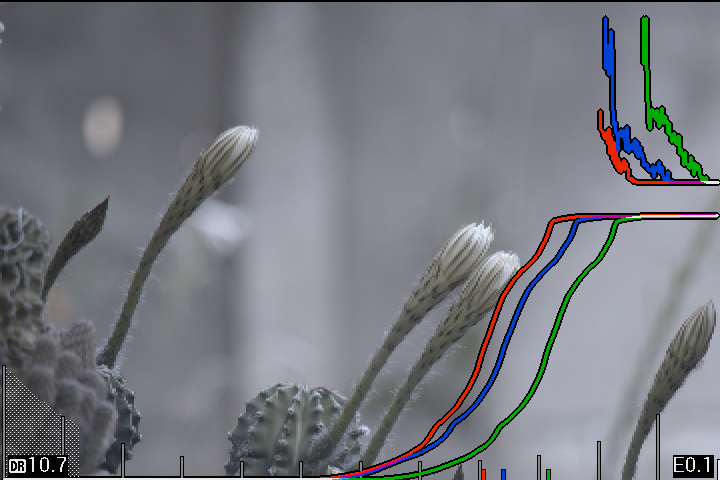 Another thing which comes to mind: perhaps with CDF it will be difficult to evaluate shadows due to the log X axis and the linear nature of raw data which always has less values in shadows. 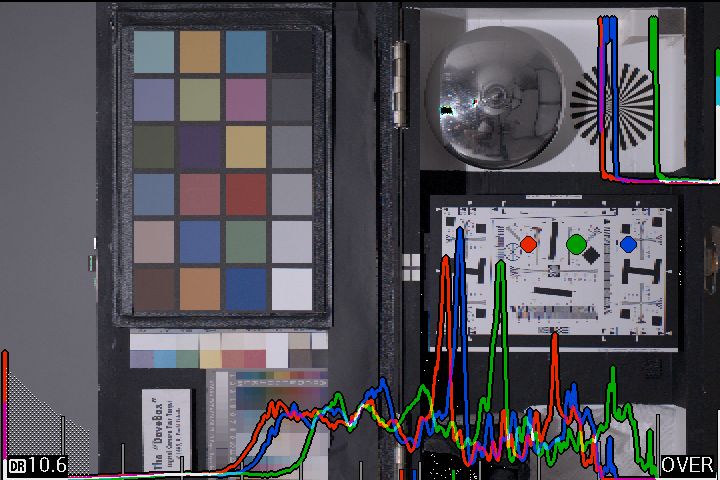 Which again comes to screen space - 80% of the CDF (or histogram) displays midtone data which is not critical for exposure control. Won't it be better to have a smaller full CDF/histo and a zoom of the critical areas? Or maybe a thin diagonal straight line? 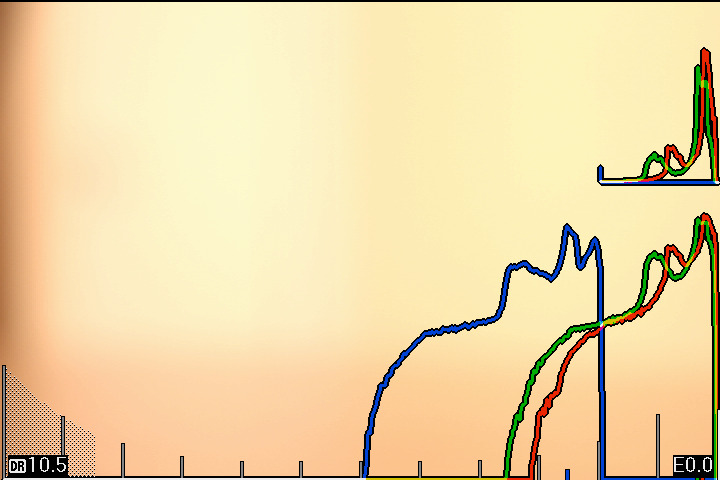 The zoomed view also shares its X axis with the rest of the graph (that's why it's placed above). Hm. But what is it zooming then? My initial idea was to have it stretched on both X and Y (damn.. I am repeating myself too much ) Another thing: having the vertical clipping line right at the edge of the screen makes it difficult to read. Maybe it needs some spacing. Just imagine shooting in a bright sunny day and having to read all that visual info. I think that compressing CDF in a way which reduces the critical areas (highlights and shadows) is contrary to what we need. 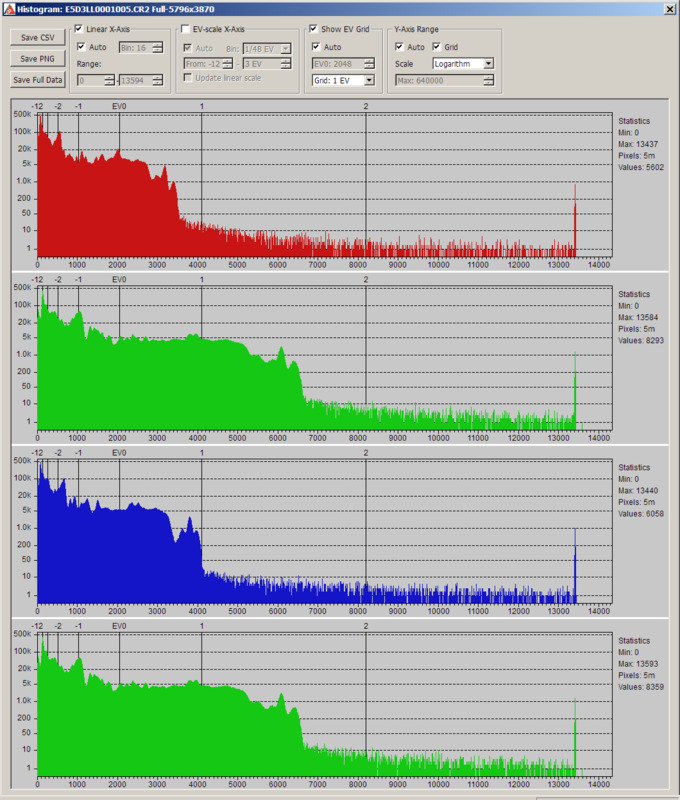 It is also contrary to the advantage of CDF to display outliers much better than a histogram. BTW: How about a new heuristics based on CDF? BTW if CDF is used - the exposure movement becomes more complex, not just left/right. False, see #14. With log scaling on X, the movement is always a translation (one notch on the grid = 1 EV). 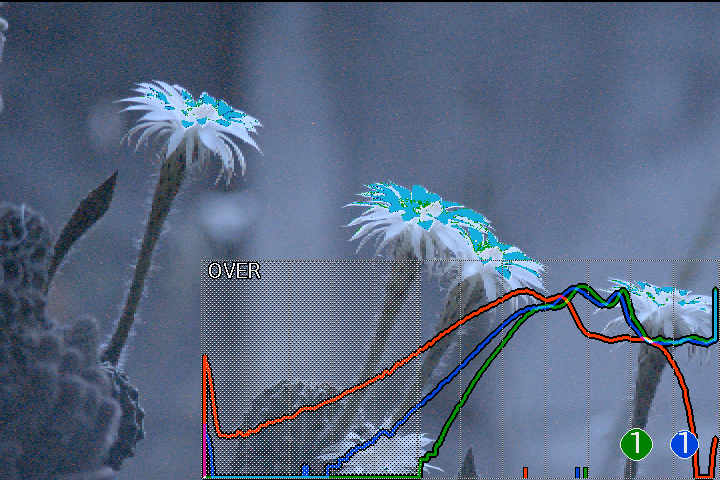 The current scaling already lets you evaluate the exposure with a resolution of 1/60 EV (if you count pixels), or ~0.1 EV (if you look at it). I don't see the need for further zooming on X. The exposure hints from Auto ETTR are also CDF-based. BTW - please try cutting down the "splitting hairs". Moved over to mobile, trying to quote specific parts of a large post is retarded. Hopefully viewers can follow. 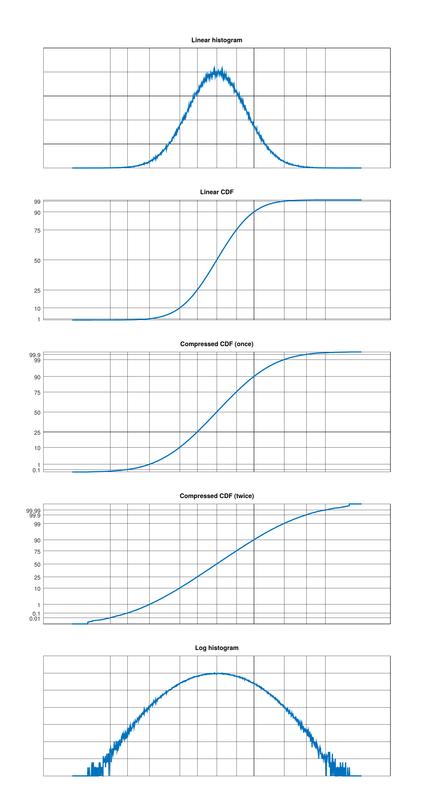 The flat areas of the CDF graph indicate areas of no signal. 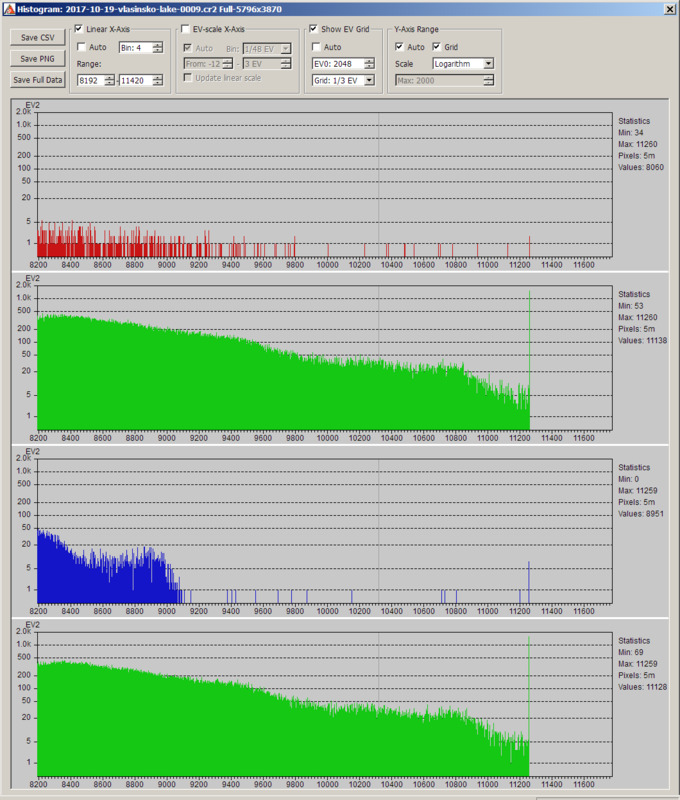 The reason why there is that large flat area in the highlights in that graph is because of the specular highlight. There is clipped data, then there is no other data until -1EV. 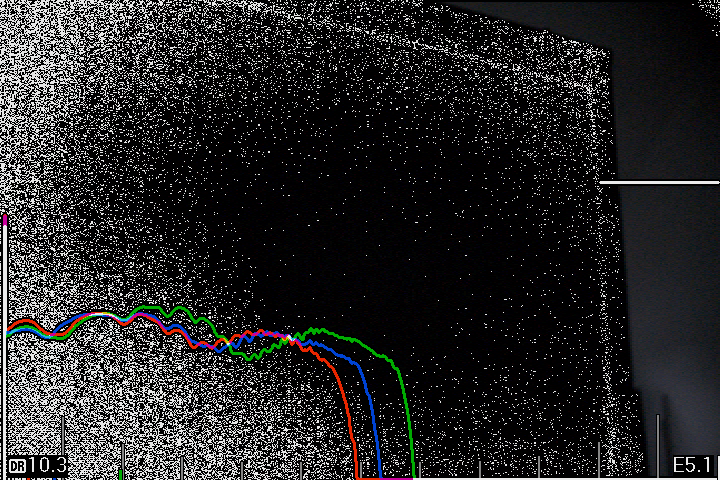 a1ex posted an example earlier with a simulated 1EV gain of that test image, and the resulting CDF graph. The principle of the flatness of the CDF graph applies throughout the entire graph. If the graph tends towards flatness, it translates to limited data in that area. Compression of the CDF graph does the exact opposite. It expands the highlights and shadows. ML is provided free as in beer. False, see #86. 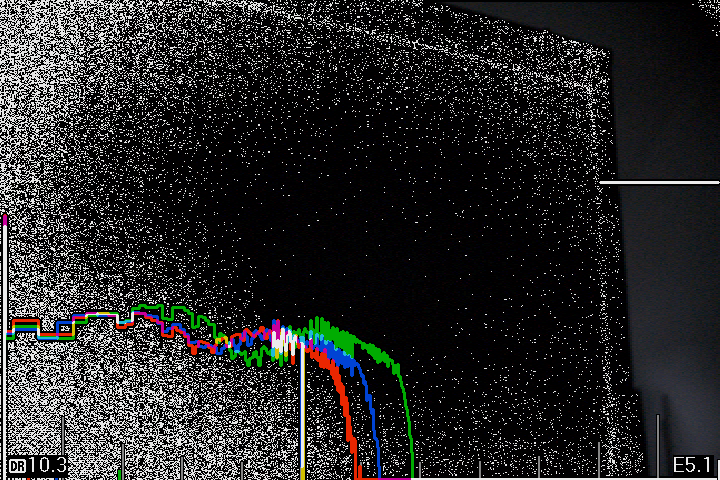 With log scaling on X, the movement is always a translation (one notch on the grid = 1 EV). Hm. You are right. I didn't think about the X-log. Sounds great. Could you at least add a little spacing (few pixels) left and right of the graphics to avoid having vertical lines being placed right at the edge of the LCD? Please don't look at it this way. The usability suggestions are based on the actual ETTR tests. 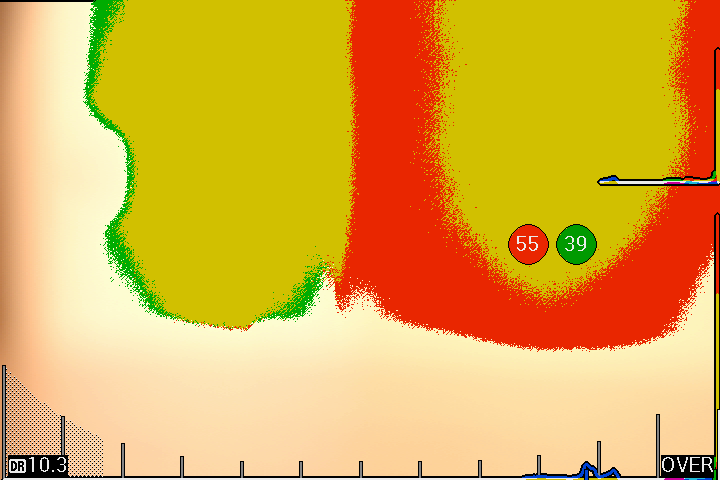 BTW what is the function of the small vertical colored ticks? Are you sure? The compressed versions show shorter flat areas for clipped shadows and highlights. 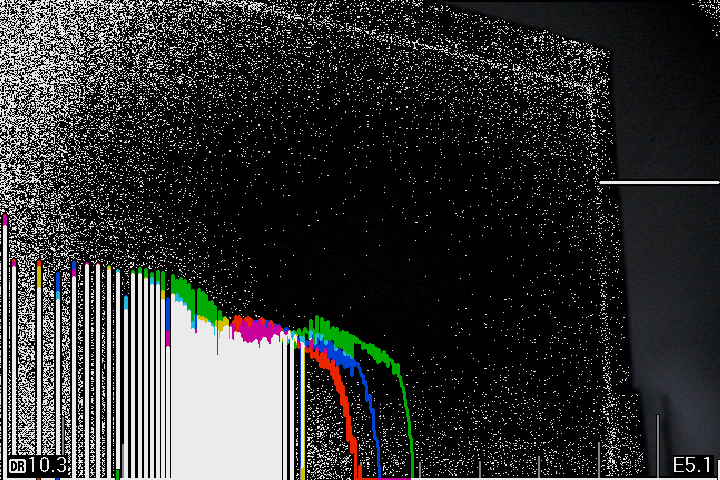 Well, CDF is simply the sum of each bin on the histogram. So, wherever the exposure algorithm sums the bins in either direction, we can say it looks at the CDF. So, even if I wasn't used with CDF as a visualization tool (until reading the linked article), that didn't stop me from using it in the algorithms (even if I didn't know it was called that way). 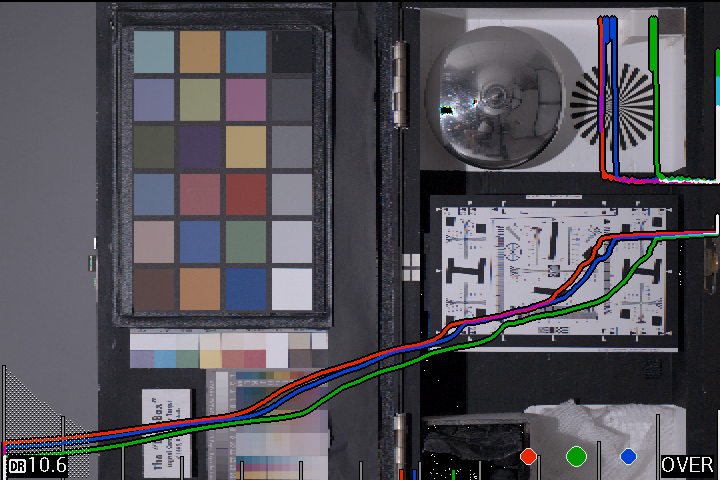 That's why, back then, I said Auto ETTR computes the exposure by looking at the histogram (which is not wrong either - as the CDF is simply the "integral" of the histogram). The tiny markers are the medians. Maybe I should find some other representation. 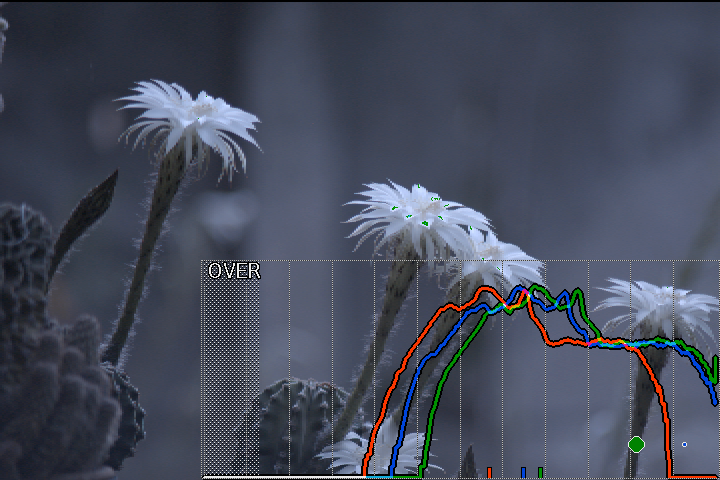 - if I decide to clip that highlight and also sacrifice the green channel (thus relying on highlight recovery), there are about 2/3 additional EV until the non-specular highlights of R and B (you may want to do that if midtones are too low). From the right picture, I can tell there's a specular highlight clipped. It's hard to tell how many stops I can move in either direction (to either capture that highlight, or discard it and maximize the SNR in the rest of the image) - I need to transform from linear to log mentally, and as Audionut said, it's not straightforward.